Japanese lacquerware and lacquerware production is known as urushi (pronounced “oo-roo-shee”). It is a word that can also refer to the lacquer itself, which is harvested from the sap of the urushi tree (lacquer tree). Urushi has developed into a spectacular and highly regarded art form over Japan's history. It culminates the beauty and elegance of Japanese aesthetics into practical objects, and it can be regarded as the pinnacle of Japanese craftsmanship. It is said that lacquerware techniques appeared in Japan approximately 9,000 years ago, and sources say that people living in the Japanese archipelago during the stone-age discovered the durability and beauty of urushi and started using it to coat wood, pottery, baskets and bone objects, as well as repair broken pottery. Since then, the technology has developed into a unique Japanese tradition. The arrival and spread of Buddhism in the 7th century also contributed to the spread of the urushi technique as it was utilized to create images of Buddha. 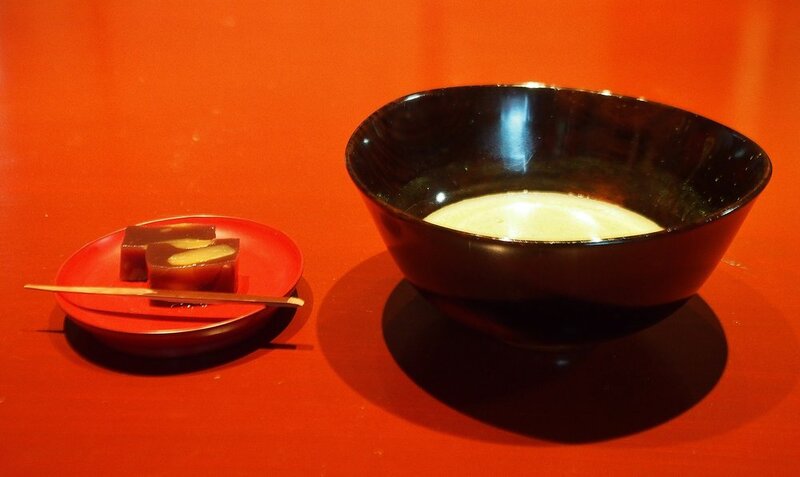 By the 8th century, urushi bowls and plates were being used as an essential part of haute cuisine. It was around this time when a new technique of applying gold powder to urushi products emerged, further enhancing the aesthetics of the lacquerware. By the 17th century, the urushi technique had a wide variety of uses. It was applied to utensils used for the Japanese tea ceremony, altars for Buddhist temples, and even armor, helmets, swords and other implements of war. Japanese urushi was first exposed to non-Japanese in the mid-16th century when Portuguese Jesuit missionaries traveled to Japan to spread their religion. They were impressed by urushi lacquerware and even requested Japanese craftsmen to make urushi for them. The urushi trade grew substantially when the Edo shogunate granted exclusive rights to the Dutch East India Company. Chests, boxes and tables are said to have arrived in Amsterdam by 1610, and it is from there that urushi lacquerware quickly spread throughout Europe as a status symbol among royal families. In order to meet the growing demand, many Europeans started to imitate the urushi technique and sell products which were called ‘japan.’ Although the end of Japan’s national isolation in 1859 allowed for the spread of urushi to the rest of the international market, the supply remained limited. Hardened urushi lacquer forms a protective waterproof coating that repels mold and mildew, and also prevents rotting and weathering. Traditionally, lacquer has been applied to wood, basketry, leather and paper products, but recently it has also been applied to other items made of ceramic, glass, metal and even plastic. Besides its high level of durability and ability to withstand the elements, urushi is most of all gorgeous to look at. Elegant and refined, yet simple and reserved, urushi has developed into something much more than just an item of utility, and it has come to be considered one of Japan's great traditional art forms. One specific technique of decorating urushi-ware that developed into a Japanese specialty is the application of gold or silver powder to urushi that is still wet, a process that came to be known as maki-e (蒔絵). It is said that this technique was introduced to Japan during the Nara period from China. With the powder, a skilled artist can create gradients of gold and silver on urushi products to produce elaborate and eye-catching designs. Covering a wet surface evenly with fine powder, however, can be quite the challenge, and it is here that an artist will rely on years of experience. Another technique that was developed was that of takamaki-e (高蒔絵), which involves using different powdered materials mixed with the urushi to created raised designs, much like an embossment. This is a technique that also takes quite some time to accomplish, requiring more layers than usual. 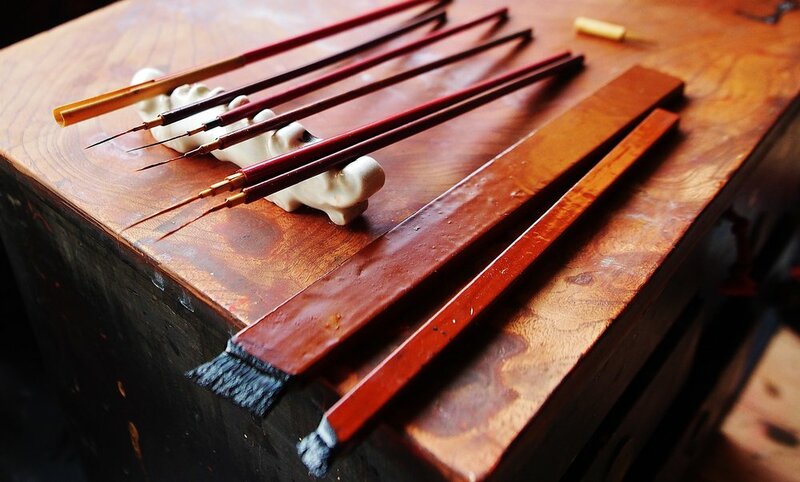 The production of urushi lacquerware is time consuming, requiring over 50 separate steps. The process can be divided into roughly four parts. 1. Urushi is collected from a lacquer tree. 2. The wooden base is produced. This step requires selecting the right kind of wood as well as drying and carving the wood. Because wood is sensitive to temperature and humidity, Japanese craftsmen have developed skills to adjust to specific conditions. 3. Lacquer is applied to the wooden base. Twenty steps are dedicated to the repetition of applying lacquer, drying and filing in order to make the lacquer more durable. 4. Gold and silver powders are applied as decoration. Each of the steps is completed by a different craftsman with specialized skills which cannot be accomplished by a machine. Different areas of Japan have different types of urushi lacquerware. The following are among the most famous types of urushi lacquerware in Japan. Although the demand of urushi dropped at one point in Japan due to the rise of plastic products, consumers have once again come to appreciate the quality and tradition. Despite this rebound in popularity, the urushi industry is experiencing a shortage of craftsmen. The urushi technique requires years of experience to be executed properly, and they cannot be imitated by machines. Also as younger generations are less willing to devote their time to learn the traditional techniques behind urushi lacquerware, it has become difficult to preserve the traditional art.